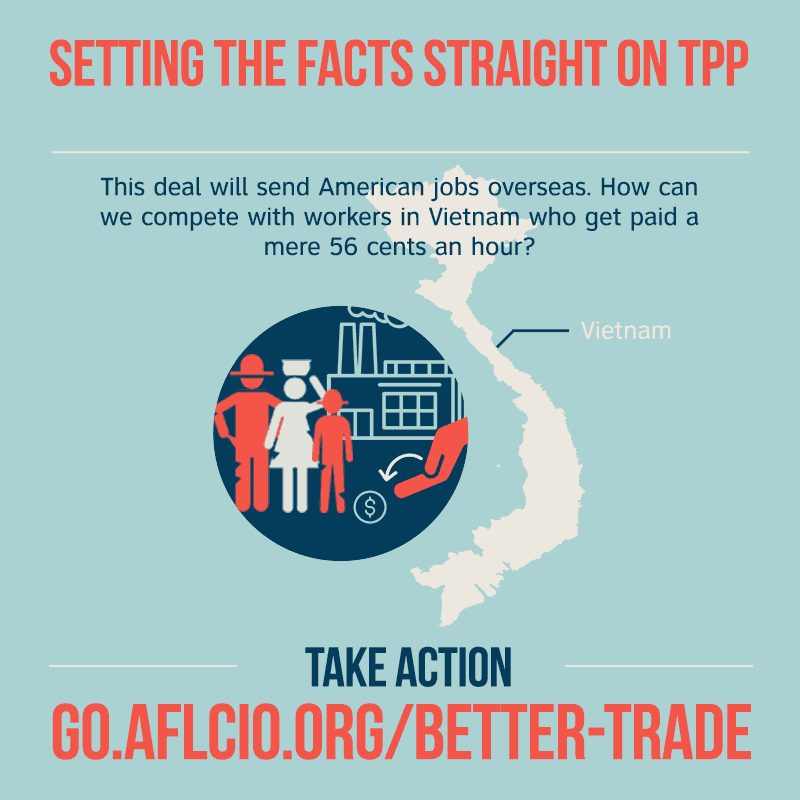 Vietnam is already snubbing the unenforceable labor provisions in the Trans-Pacific Partnership (TPP). A Vietnamese labor activist has accused authorities of beating and detaining her after she talked with fired workers in southern Long An province. … Hanh, co-founder of Free Viet Labor Federation, and another activist, Truong Minh Duc, said they came to give support and advice to dozens of workers who maintained they had been unlawfully fired by a foreign-owned company. The monthly minimum wage for Zone 1 will increase from the current VND3.1 million ($138) to VND3.5 million ($155.8), and that of Zone 2 will rise from VND2.75 million ($122.4) to VND3.1 million. For Zones 3 and 4, the monthly minimum wages will go up from VND2.4 million ($106.8) and VND2.15 million ($95.7) to VND2.7 ($120.2) million and VND2.4 million, respectively. Got that? After the raise workers in Vietnam will be starting at $155 a month. That’s as little as $6.45 a day for Vietnamese working the standard six-day, 48-hour workweek. And that’s the top minimum. Others will be getting $95.70 a month, as little as $3.99 a day. So you have “foreign-owned companies” illegally firing workers who will be making less than $7 a day. Workers are harassed, arrested and beaten if they try to do something to improve their lives. And TPP is being sold as a “job creator” here in the U.S. Right. TPP has special provisions for enforcement of provisions that benefit corporations, while the already weak labor, environmental and other provisions that protect other “stakeholders” get no special enforcement mechanisms. Corporations can bring their own cases to a special corporate court that sits above governments, where corporate attorneys adjudicate. 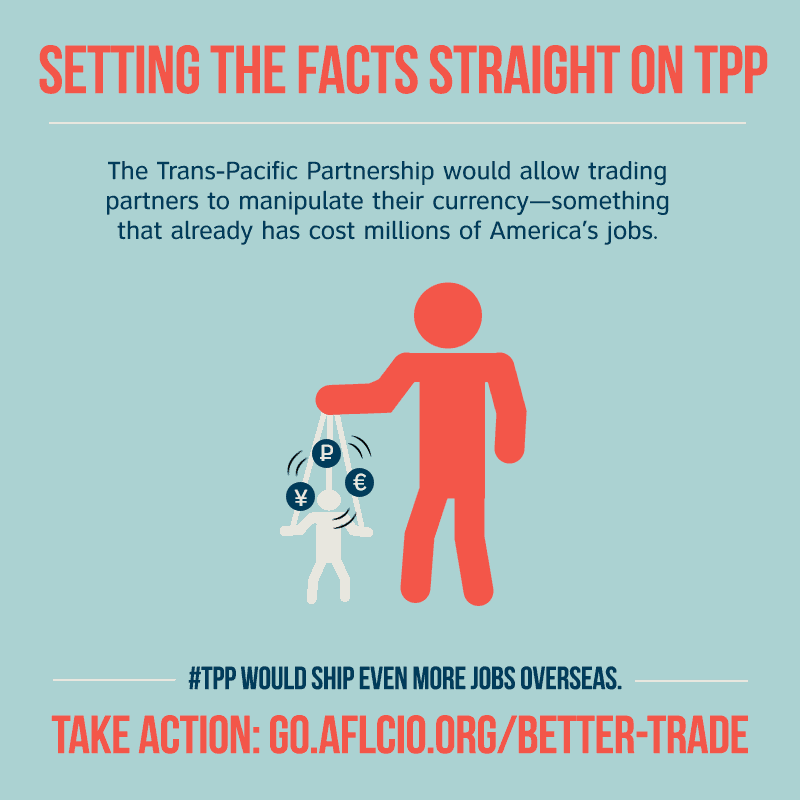 But violations of TPP’s labor, environmental and other provisions depend on governments to decide to bring the cases. And these cases do not go before panels friendly to labor or environment or other aggrieved parties. Our own government won’t even enforce labor rules inside our own country, never mind filing trade cases. To make matters worse, the “fast track” trade promotion authority clearly specifies that the U.S. cannot enter into a trade agreement with countries designated as participating in human trafficking (slavery). Malaysia was designated as a human trafficking country. So to grease the skids for TPP our own government reclassified Malaysia, even though Malaysia had changed nothing. A Reuters investigation reported that the State Department downgraded Malaysia for political reasons. House Democrats and “stakeholder” groups are demanding an investigation. …he was cooped up in a filthy, overcrowded detention center near Kuala Lumpur’s international airport, squatting or sleeping on the floor in a hall with scores of other men. During his fourth month, wardens ordered them not to move or talk, he says, and beat them with belts if they did. “There was no rest. You couldn’t sit or lie down without touching someone else,” he said, pointing to a welt on his forearm that he says he received when a guard beat him for arguing with another detainee over space. … senior officials instead in July upgraded Malaysia to the Tier 2 Watch List, freeing the country from potential sanctions and international condemnation, and paving the way for the ambitious 12-nation Trans-Pacific Partnership trade agreement. If Malaysia remained a Tier 3 country, the Obama administration would have had to exclude it from the deal under the fast-track negotiating authority it had from Congress, potentially torpedoing the agreement. Starkly worded criticism of Malaysia was excised from the final report, according to internal documents seen by Reuters that have not been previously made public. … The analysts were overruled by senior American diplomats at the State Department, according to sources with direct knowledge of how the report was compiled. By the time the report was published, much of the tougher criticism of Malaysia’s detention facilities was removed. I discussed this in a “Malaysian Slavery & the TPP” segment of “The Zero Hour with RJ Eskow” last August. PS Japan recently announced it will ignore the unenforceable currency side-agreement. This means companies making things in the U.S. will be put at a competitive disadvantage against companies making things in Japan.